I remember counting 1, 2, 3, 4… blisters on my toes from (unnecessarily) wearing heels two weeks straight. I remember having hunger pains from not eating lunch and dinner (there’s like no time). I remember having the biggest bags under my eyes (and no, I’m not referring to Prada although today’s bag is worth mentioning. More on this in a second…) And I remember having the biggest smile on my face. I think it’s important to look back; to remind yourself why you started in the first place. Things like where I sat or what I wore didn’t faze me. The only thing I cared about was seeing the fashion; meeting new people (many of which I’ve stayed in touch with) and simply being in the same environment as the same people I looked up to and adored. It was exhilarating and exhausting. Sure, today I get invited to shows on behalf of my blog but not to all of them, trust me. I’m still a “number” and my value is wrapped up in likes and engagement. That’s it. When I think about it like that, it stings a little so I try and harness the same feelings I felt watching my first show, pure joy, and look back four years ago when I felt so incredibly blessed to have somehow finagled my way into such an exciting time for fashion. 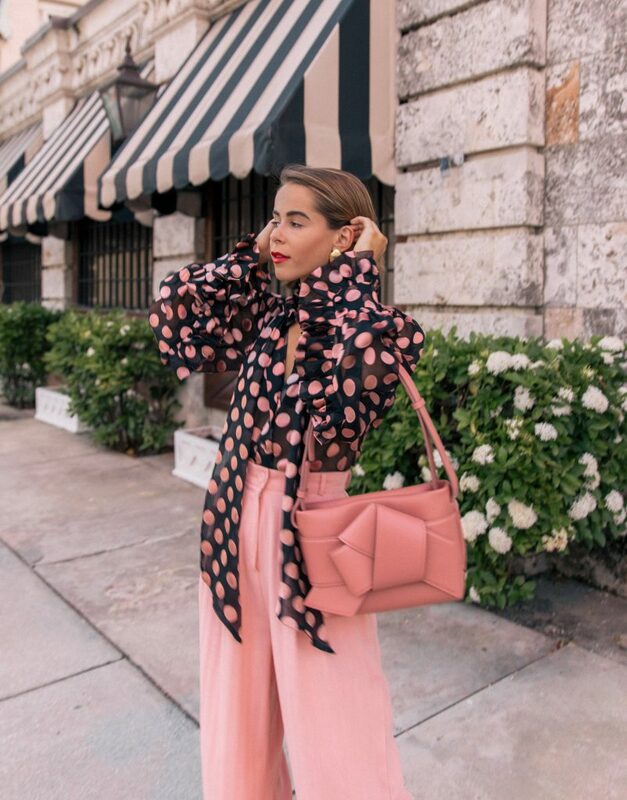 I’m wearing a polka dot blouse from Zimmerman with blush pink pants. I wanted to focal point to be my bag so I went with… dun, dun, dun… my new Acne bag from my lovely friends at MONNIER Frères. (In case you missed the first look I styled with this bag, head over to this post here. You can also read more about why I think MONNIER Frères is the perfect destination for all things designer accessories – so many hidden gems!) Most of the pieces I brought with me to Fashion Week are red, pink, yellow and orange so this bag will weave seamlessly into my looks. I can’t wait to feature it again! To those who are attending Fashion Week in NYC this week, I hope you have an incredible time and I hope we meet! To those who are not attending Fashion Week, I hope you enjoy following along… as always thanks for stopping by! It’s always important to take the time and reflect how much you’ve accomplished. I’m such a fan of your blog and that you are a petite! I can only hope to achieve what you have some day. Keep up the amazing work!